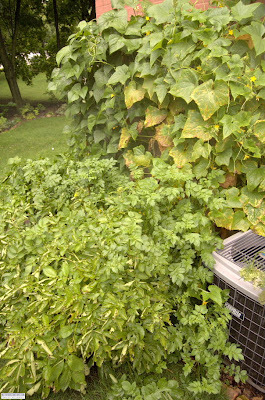 Tomatoes & Pumpkin vines. There are 3 pumpkins growing on 2 vines, two of them are defiantly a pie pumpkin but one is looking like it may grow to be a large pumpkin. Cucumbers climbing to the second floor. The lower vines have almost lost all there leaves but I am still able to pick a couple cucumbers every few days. The zucchini seeds I started after identify the pumpkin mix up. 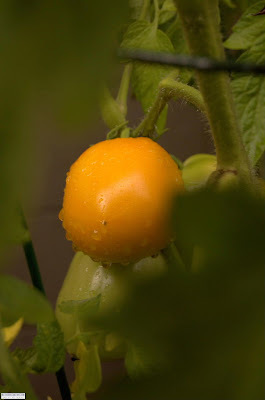 As with most veggie bloggers I am hoping there is enough time left for these late comers to produce. Broccoli transplants. Even though the row cover keeps the cabbage butterflies off it does not stop slugs from munching away. They do seem to rebound well from there grazing. Brussel Sprouts, Celery & Broccoli. The celery has grown well but I really don't like celery unless it is in stew or soup. I don't eat stew or soup unitl the fall & winter so this is kind of a waste of space. It is also a great host from ear wigs which eat the inner flesh of the celery. Next year I will not be growing celery. Aww aren't they sweet looking and quiet, the best time of the day! The cats really have not been that bad though. Asides from feet attacking & towel attacking well folding to name a few they are entertaining to watch and nice to pet. I will be posting this week about what I have been harvesting lately as well as a recipe for raw sauce. It is a tomato, pepper, onion relish that is jarred & processed for safe keeping. It is very good on hamburgers and is a great use from the excess tomatoes this time of year. 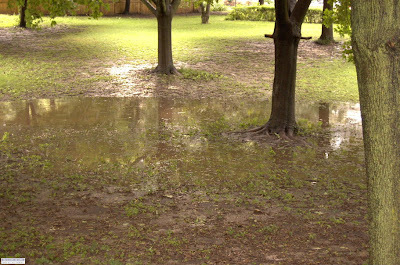 The past weekend was another wet, stormy weekend. Toronto has broke records for rain fall this summer and my area is well above average but to my knowledge we have not broken any records. I must say it has been great not having to drag the hose around. The photo above is of the treed lot behind our backyard. I have never seen water collect like this in the 5 years we have lived here. One thing that is not faring well is my cucumbers. The leaves are covered with yellow spots and shortly after they go brown and crispy. They are still putting out cucumbers thought so that is a good thing. I think next year a disease resistant variety will be on the shopping list. 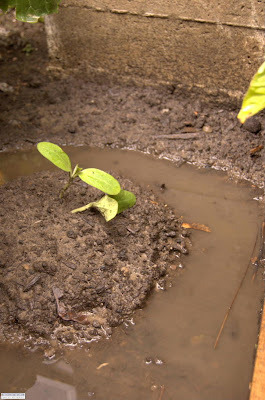 The rain has also been swamping my seedlings but thankfully it does not seem to bother them. The plant that seems to like this weather the most is the accidental pumpkin vine. You can watch this plant grow daily with the one pumpkin going from a large marble size to a soft ball size in a week. Some what on topic, I have visited another waterfall in Hamilton, ON. This time it was Albion Falls which is located on Mountain Brow Blvd on the south side of Hamilton. The rain has certainly made all the waterfalls more spectacular this summer, usually this time of year the flow is reduced. Here is a few photo's for the waterfall. The drive to Toronto was good and we only were stuck in traffic twice for about 15 minutes each time. After the drive and finding some were to park that was not $30 dollars, we hit the pavement with the camera and tripod at 8pm. This left about 45 minutes of good sun setting light and the remaining time being spent on night photography. It was really exciting, some much so that we ran about 1hrs20min late picking up my sisters fiancé. Needless to say he was a little cranky about this but such is life. It was a much longer drive home due to construction reducing the highway to one lane so we did not make it back until 2:30am ish. Although I could have kept taking pictures all night if we didn't have to pick up Kris. Brookfield Place, KI Resturant, Bay St. I have just pulled all the beets, they had all grown to a good size and they were in the way of me being able to plant more broccoli. After pulling the beets I found the little toad in the photo below the beets. The toad blends in very well, I am surprised I even noticed it was there. After taking a couple photos of the toad I picked it up and moved it to the shade of the brussel sprouts. I feel like I should have a drum roll before this photo, Tomatoes, finally. So far I have picked 3 cherokee purples, 1 moonglow & 1 japanese trifele black and still waiting on aunt ruby's german green & hillbilly potato loaf. I have also added a tomato count to the side bar, I have keeped up the weight count pretty well so it should be even easier to keep count of the tomatoes. 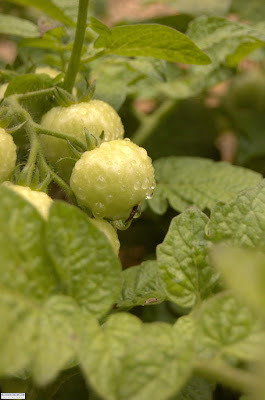 Next year I am planning on having ripe tomatoes by july 1st at the latest. I am going to start them earlier, keep potting them up under lights until I can plant them out. 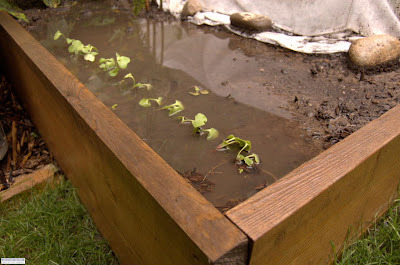 Then plant them out either in a cold frame or plastic tents to get a jump start on the season. Butter toasted bread, then spread mayonase and top will tomato & bacon. Simply, Fast and very tasty. Start of by adding a bunch of chives to a blender or food processor and add oil until it is at the level it will blend together readily. Once the oil turns green strain into a squirt bottle or bowl and put aside. Now cut up the tomatoes and fresh mozzarella about a 1/4" thick. Place one tomato on the plate and then partly cover the tomato with mozzarella and season with salt, it takes a good amount of salt to season the tomato & cheese. Continue this until the plate is full. Once it is arrange and seasoned drizzle the chive oil and vinegar over the dish. The rule of thumbs for oil to vinegar is always 3 parts oil to 1 part vinegar so aim for this. When it is all dressed let it sit at room temperature so the flavors meld together. I made it before starting dinner, this seemed to offer enough time for it to marinate. Anyhow, I am off to Toronto this evening with my Sister to pick up her Fiance. 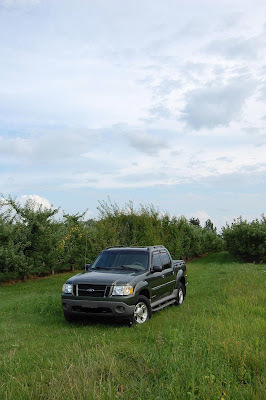 If I am blogging again in a couple days it means she did not kill me on the highway! Pray for me, lol. If you recall a while back when I was saying that I planted my zucchini with compost that not to my knowledge had squash seeds in. Well I ended up with two pumpkin vines and no zucchini, I guess I thinned the wrong one. I believe it is a pie pumpkin because that is the only pumpkins I have had. It should be nice to have home grown, home made pumpkin pie. 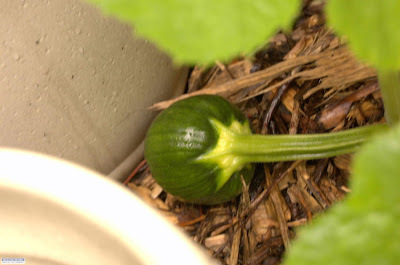 When I realized it was a pumpkin growing I planted some new zucchini seeds in place of my cabbage, there is just enough time from them to grow before the frost, about 50 days. I didn't use my compost this time. Speaking of the cabbage, they had a little miss hap. They start to get a fair amount of cabbage butterfly damage and I was just about to pick them because of this. Well when I first thought this I should have pulled them because a critter in the night came and ate a 1/4 of each head. So needles to say they when in the composter, not really interested in wild animal saliva, yuck! The real exciting part is my tomatoes are starting to turn and I should be able to start picking some tomorrow. This is great but I still want to try and get my tomatoes producing ripe fruit by July not August. I have also been busy with fall crops. I have ground seeded the turnips and they have just germinated. The third broccoli seedlings I started did not even sprout this time but I was lucky enough to score transplants from a farmer in the Dundas, Ontario area. I bought a bag of 10 plants for $1 buck, what a deal! They are some really nice looking plants and I have them in the ground already. They are growing in a row covered tunnel to keep the cabbage butterfly off of them as well as to keep some of the heat off of them. The cucumbers are just starting to be large enough to pick. The plants are getting yellow spots on the leaves, this must be some disease. I am guessing it is from all the rain we have had and I am hoping I get a good crop before it kills the plant. The pole beans are just starting to produce good size beans but the lima beans have just flowers so far. After doing u-pick strawberry this year and then making strawberry jelly, I decided to do the same thing with raspberries. Having never picked raspberries before I found out in a hurry that it is a little tedious, it took 1.5 hours to pick 4 litres(4 quarts.) The plants did not have many thorns so that was a good thing and the weather was nice so it was rather enjoyable to be out in the field. I did manage to get raspberry juice on my new, white patchwork shorts, never been one to dress appropriately. I am going to make jelly, a cheese cake as well as freeze what's left over the next couple days. I also found many insects in the plants so I will post photos’ of them below as well as other photos I took. It really is amazing the variety of things you can find in plain sight. It seems now a days everyone wants you to think the environment is going to hell, it seems like it is doing fine to me. As well as the whole arctic melting thing, last time I checked to form ice it would have had to be water at some point so how is it unnatural for it to melt again? Anyhow that is my rant of the day. I will post about the vegetable garden in the next couple days, exciting things are happening!!! Milk Weed beetle, on a Milk Weed plant. Big Green in the field, about the closest thing it gets to manual labour.